I made some chicken mittens! 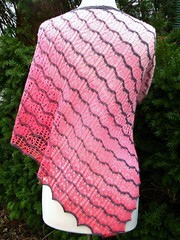 This was the July Rockin’ Sock Club “not a sock” pattern. 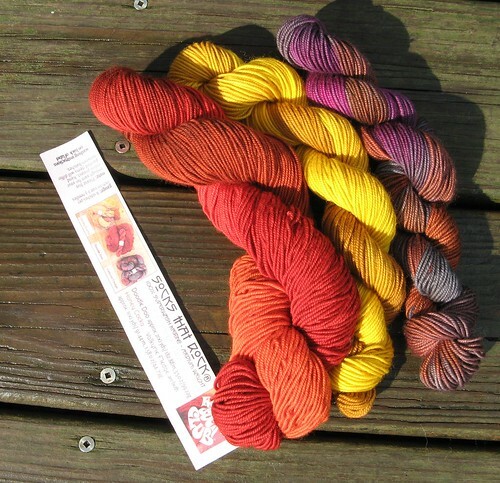 The club yarn was GORGEOUS, as you can see. I loved the whimsy of the chicken mittens. I have to say I was a bit disappointed in how the red/purple colorwork on the cuff just doesn’t show up as colorwork — the colorways just overlapped too much, sharing more than one red/brown hue. Similarly, some of the brown in the yellow colorway was close enough to the brown in the red colorway that some of the rooster’s tail can be a bit hard to see. This makes him look off-center on the mitten. However these are minor quibbles. 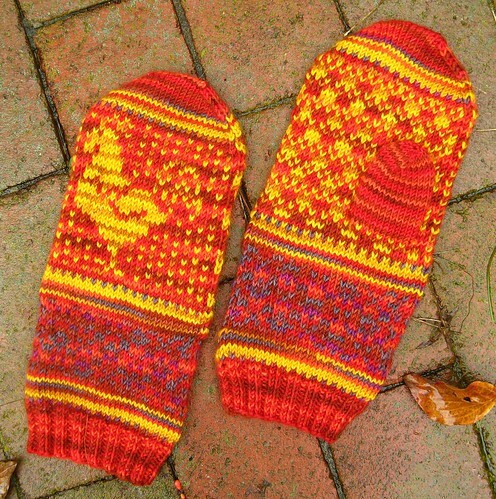 After waiting (and waiting, and waiting) for the mittens to dry, they have become my go-to mittens this season. Honey Cocka Doodle Doo, my Valkyrie Fledge!